Hiring good people is hard. And yet nothing matters more in winning than getting the right people on the field. All the clever strategies and advanced technologies in the world are nowhere near as effective without great people to put them to work. 1. The first characteristic is authenticity. Why? It’s simple. A person cannot make hard decisions, hold unpopular positions, or stand tall for what he believes unless he knows who he is and feels comfortable with that. I am talking about self-confidence and conviction. These traits make a leader bold and decisive, which is absolutely critical in times when you must act quickly. Just as important, authenticity makes leaders likable, for lack of a better word. Their “realness" comes across in the way they communicate and reach people on an emotional level. Their words move them, their message touches something inside. When I was at GE, we would occasionally encounter a very successful executive who just could not be promoted to the next level. In the early days, we would struggle with our reasoning. These executives demonstrated the right values and made the numbers, but usually their people did not connect with them. What was wrong? Finally, we figured out that these executives always had a certain phoniness to them. They pretended to be something they were not—more in control, more upbeat, more savvy than they were. They didn’t sweat. They didn’t cry. They squirmed in their own skin, playing a role of their own inventing. Leaders can’t have an iota of fakeness. They have to know themselves—so that they can be straight with the world, energize followers, and lead with the authority born of authenticity. 2. The second characteristic is the ability to see around corners. Every leader has to have a vision and the ability to predict the future, but good leaders must have a special capacity to anticipate the radically unexpected. In business, the best leaders in brutally competitive environments have a sixth sense for market changes, as well as moves by existing competitors and new entrants. The former vice-chairman of GE, Paolo Fresco, now chairman of Fiat, is a gifted chess player. He carried that skill into every global business deal he made over the course of 30 years. Somehow, because of his intuition and savvy, he could put himself in the chair of the person across the table, allowing him to predict every move in a negotiation. To our amazement, Paolo always saw what was coming next. No one ever came close to getting the better of him—because he knew what his “adversary" was thinking before the adversary himself knew. The ability to see around corners is the ability to imagine the unimaginable. 3. The third characteristic is a strong penchant to surround themselves with people better and smarter than they are. Every time we had a crisis at GE, I would quickly assemble a group of the smartest, gutsiest people I could find at any level from within the company and sometimes from without, and lean on them heavily for their knowledge and advice. I would make sure everyone in the room came at the problem from a different angle, and then I would have us all wallow in the information as we worked to solve the crisis. These sessions were almost always contentious, and the opinions that came at me were strong and varied. And yet, my best decisions arose from what I learnt in these debates. Everyone came out of the experience more informed and better prepared to take on the next crisis. A good leader has the courage to put together a team of people who sometimes make him look like the dumbest person in the room! I know that sounds counterintuitive. You want your leader to be the smartest person in the room—but if he acts as if he is, he won’t get half the pushback he must get to make the best decisions. 4. The fourth characteristic is heavy-duty resilience. Every leader makes mistakes, every leader stumbles and falls. The question with a senior-level leader is, does she learn from her mistakes, regroup, and then get going again with renewed speed, conviction and confidence? The name for this trait is resilience, and it is so important that a leader must have it going into a job because if she doesn’t, a crisis time is too late to learn it. That is why, when I placed people in new leadership situations, I always looked for candidates who had one or two tough experiences. I particularly like the people who had the wind knocked clear out of them but proved they could run even harder in the next race. The global business world today is going to knock any leader off her horse more than once. She must know how to get back in the saddle again. 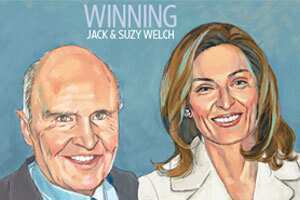 Adapted from Winning (HarperBusiness Publishers, 2005) by Jack Welch with Suzy Welch.